Mixing traditional style with a rock-n-roll attitude, this Indian Hill remodel brought a cohesive and eye-catching design to four separate spaces, turning the master suite into an enviable destination in the home. Bold but curated selections in tile, counters, and hardware work in tandem with the classic and traditional bones of the cabinetry. 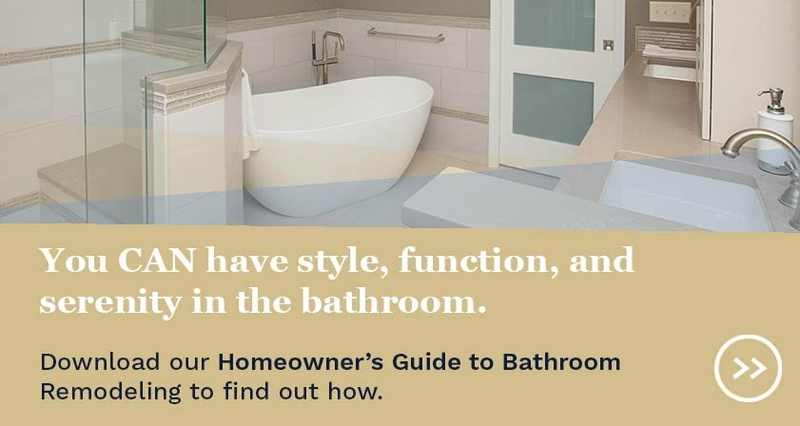 This project encompasses dual master baths, a walk-in closet & dressing room, an a hallway that connects the spaces and adds additional closet storage. The style of the bathroom before the remodel was dominated by a too-bold, dated tile. 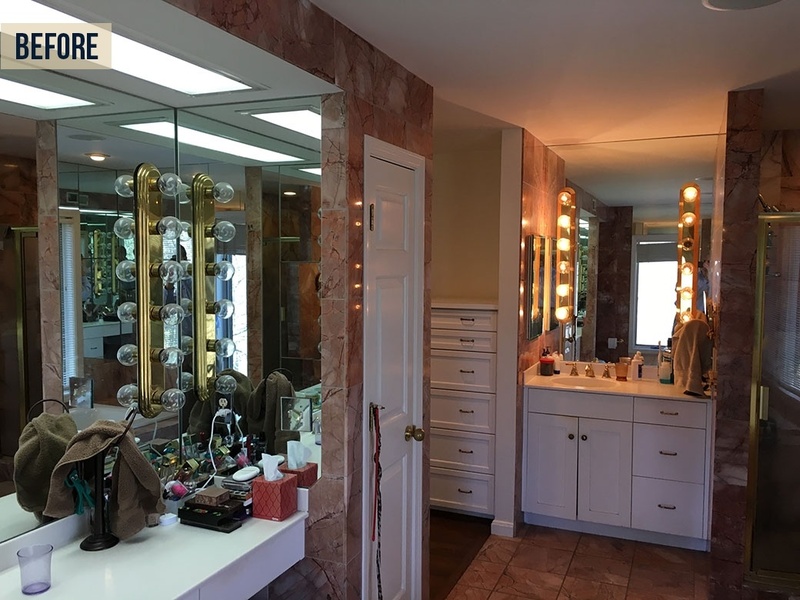 To add to the 80's glam look, the mirrors were flanked by dressing room lights, which left the room feeling too disjointed from the traditional style of the home. Attached to the bathroom was a claustrophobic walk-in closet that was not able to handle the homeowners' large clothing collections. 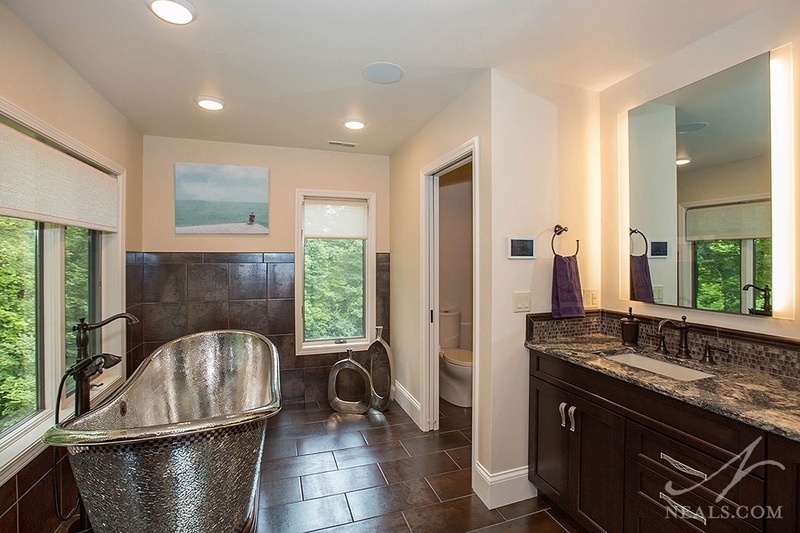 Next to the master bedroom, a guest bedroom with an attached bath sat primarily unused. The new design called for a few simple adjustments to the layout of the vanities in the master bath. 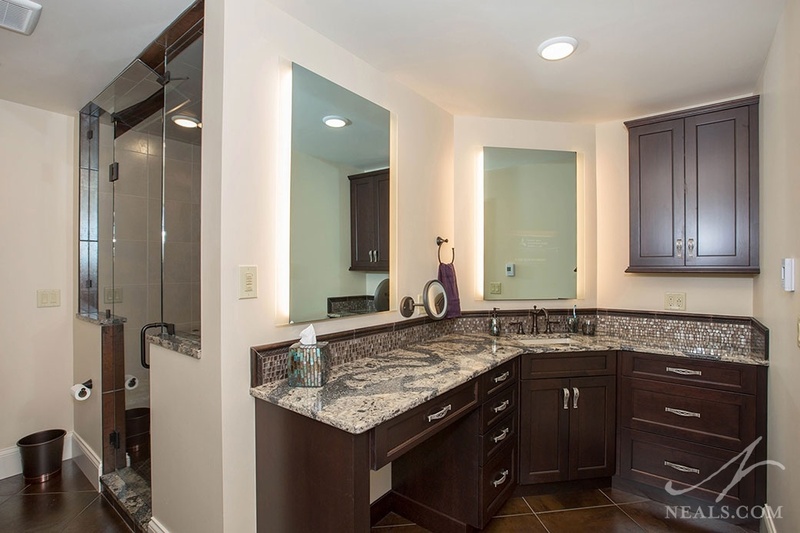 Now, the double vanity wraps around the room's central corner. This allowed the shower, which had previously been crammed into the corner, to expand outward. The shift in layout also accommodated a separate commode closet. The showpiece of the space is a new free-standing metal soaking tub. The exterior of the tub is decorated with a glittering, polished metal mosaic. The interior displays a hammered texture. 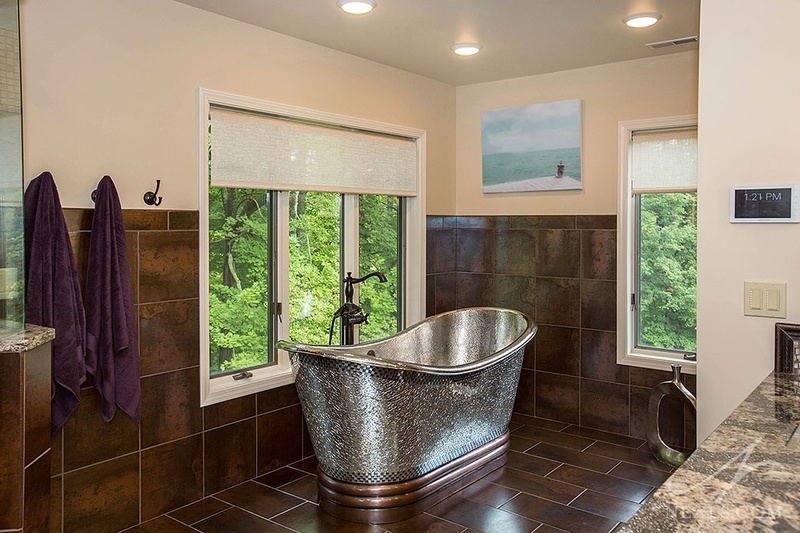 The glittering quality of the unique tub is captured in other areas around the space. The counter top on the vanity includes similarly-shimmering veining. The handles on the cabinet doors are textured nickle with a filigree detail. Adjacent to the master bath and winding through an L-shaped hallway is the "his" closet. 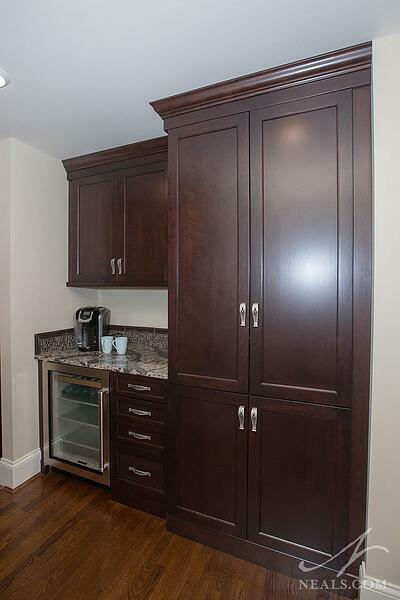 Also in this area, a storage built-in includes a beverage fridge and a counter for convenient morning prep. Continuing through this area leads into the new boudoir. The empty guest room is now a full "her" closet. The space features a large island for outfit planning and drawer storage. Around the perimeter, various hanging and shelf spaces hold the homeowner's large clothing collection. One wall, around the large window, is devoted entirely to shoe display. 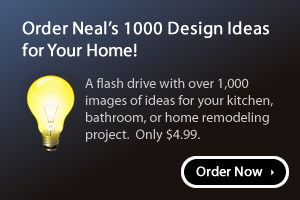 Through the next door is the remodeled second bathroom. The counter here is a sink and vanity combination. 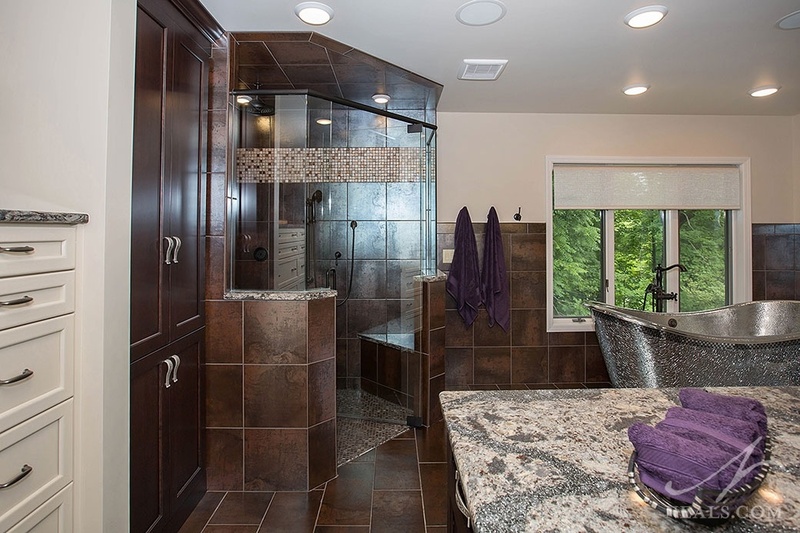 Around the corner is a walk-in steam shower with a glass front wall and the commode. The finishes through all four spaces reference each other, pulling the entire space together into one design. Tile in the master bath appears again in the second bath. The countertop of the boudoir island is the same as the vanities. The tile mosaic accent appears in the morning prep space. Each element brings with it the quality of bold character, making the remodeled suite a classy knockout. Specal thanks to Sacksteder's Interiors for some of the accessories used in this space.